If you have have a dog and a cat in the same house, you will know the need for this article. Dogs and Cats are almost never friends without extra efforts of the owners. They hardly get along, and this happens for so many reasons. This includes a fear of being displaced as the loved pet in the house, which is usually normal. It is sometimes a simple competition that can be handled with civility. Their hostile reaction is usually because of their territorial traits, not really a mythical force behind the scenes. It doesn’t always have to get bloody when you are bringing a new pet home, and here’s how. 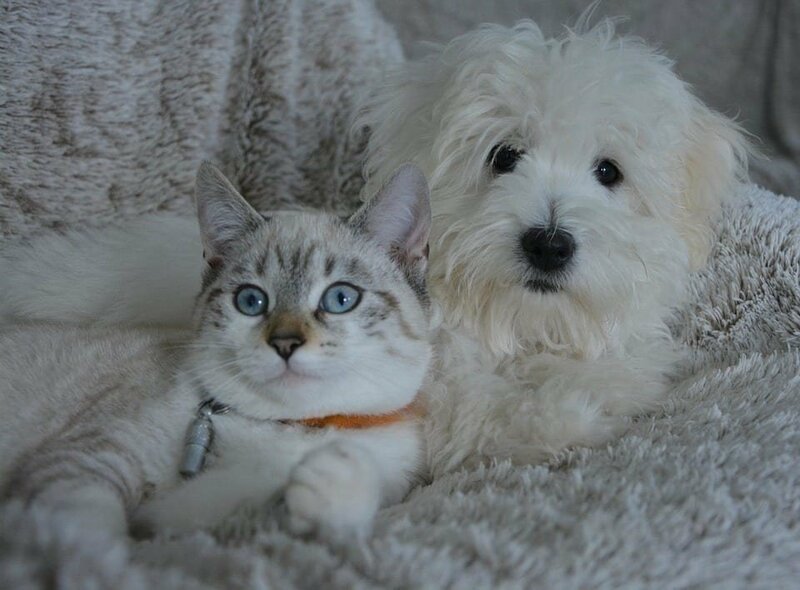 PREPARE THE HOUSE TO ACCOMMODATE TWO PETS – You can’t put two territorial strangers in a small room and expect all to be well. If they had no reasons to fight, their inability to find a space of their own – apart from each other, will start the war. In order to prevent this, make sure the house is big enough for both pets to live conveniently away from each other. They should mostly be put in separate rooms. DON’T FORCE THE PETS TO GET ALONG IMMEDIATELY – Seeing the other pet the first or second day may not be so advisable for you because they might just set it off right there and start the war. So, you must keep them away from each other and get them to settle in. Wait for them to get convenient and make sure they see each other from time to time, at a reasonable distance. MAKE SURE THEY ARE BOTH RESPONDING TO COMMANDS – The first few waiting days should be dedicated to revising your pets’ training; individually. Make sure they can both respond to simple and necessary commands and especially their names. The names are very necessary because you may need to give them both different commands while they are together. 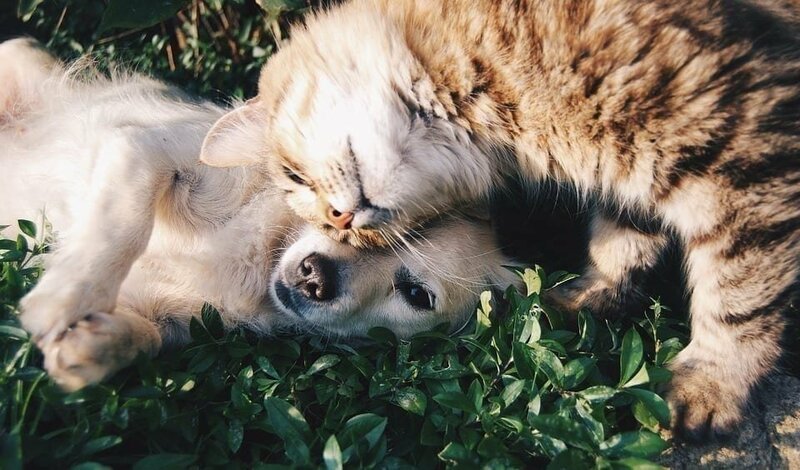 ALLOW THEM TO MASTER EACHOTHER’S SMELL – Pets usually go easy on people or animals whose smell they are familiar with, so one of the steps to getting them to like each other and not fight all the time is to let them get to smell each other from time to time. You can do this by putting them in the same room but with a barricade that does not allow them to touch each other. You can also alternate their ‘homes’ in your house. WATCH FOR WHEN THE CAT IS CONVENIENT BEFORE INTRODUCTION – Cats are usually more inconvenient around dogs than dogs are around them. So you might have to wait till your cat is convenient before bringing them to a dog without restrictions. However, you can test for this convenience by bringing the cat close to the dog while still holding it, to see if it fidgets or struggles to get away. BRING THEM TOGETHER AND SHOW THEM THE SAME AMOUNT OF LOVE – When they are both convenient, bring them together and play with both of them. Introduce them to each other, but don’t allow them to stay together for too long the first time. Continue this until they begin to play with each other without your intervention. This might be a very difficult process, especially if you are trying to bring two pets; who have known each other as enemies before, to become friends. However, if you keep at it, you will see results. I Despite being cannibalistic because of the tendency to eat other jellyfish, jellyfish are preys to other predators like swordfish, tuna, sharks and others; this makes them rely heavily on their transparency which hides them conveniently. II The Moon jellyfish is the most common specie in the waters of North America and Europe because it lives very close to the surface of the water. Its color varies from blue to pink and has a mildness to its sting. IV Jellyfish are known to excrete from the same hole in the bell which serves as the major section of their body. They are regarded as semi-carnivorous because of their diet which consists of plankton, small fish, and crustaceans. V The lifespan of jellyfish vary from as short as a couple of hours to as long as living for a few years, sometimes even more. A jellyfish\'s lifespan is dependent on whether it is in captivity, where it lives much longer or free, where it is at risk. VI The 2008 movie Seven Pounds shows Will Smith in the character Ben Smith, an IRS agent who commits suicide by putting a deadly jellyfish in his bathtub. The title refers to the seven pounds of flesh Will Smith gives to other people to pay penance for accidentally killing seven innocent people in a car accident.